Daimler Commercial Vehicles MENA and EMC deliver 27 Mercedes-Benz Zetros trucks to Suhail Al Mazroui Est. 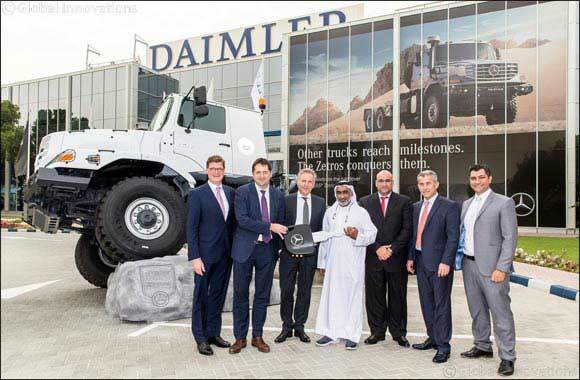 Dubai, UAE, April 3, 2017 – Daimler Commercial Vehicles MENA FZE and Emirates Motor Company (EMC), the authorized General Distributor of Mercedes-Benz in the Emirate of Abu Dhabi and the flagship company of the Al Fahim Group, have delivered 27 Mercedes-Benz Zetros 6x6 tractor-heads to the customer Suhail Al Mazroui Transportation and Heavy Equipment Establishment. Part of the fleet deal is the 5,555th Zetros produced, which was handed over in the presence of Stefan Buchner, Head of Mercedes-Benz Trucks Europe/Latin America, Till Oberwoerder, Head of Marketing, Sales and Services Mercedes-Benz Trucks and Roland Schneider, President & CEO of Daimler Commercial Vehicles MENA, at the Regional Office of Daimler Commercial Vehicles MENA in Dubai on March 23rd. The handover ceremony was also joined by Bilal al Ribi, General Manager Commercial Vehicles, and Hany Tawfik, General Sales Manager Mercedes-Benz Trucks, both representing EMC. The 27 Mercedes-Benz Zetros 3643 AS come with a powerful 12-litre 6-cylinder engine sporting 428 hp and providing a Gross Combination Weight (GCW) of 116 tonnes. The all-wheel drive cab-behind engine trucks stand out with their extreme off-road capabilities and superior driving comfort in difficult terrain, perfectly matching the high demands in the Oil & Gas segment. Mercedes-Benz Trucks is offering the Zetros across the MENA region in various specifications, including 4x4 and 6x6 chassis variants, the 6x6 tractor head version, and engine outputs in the range of 330 hp and 430 hp.